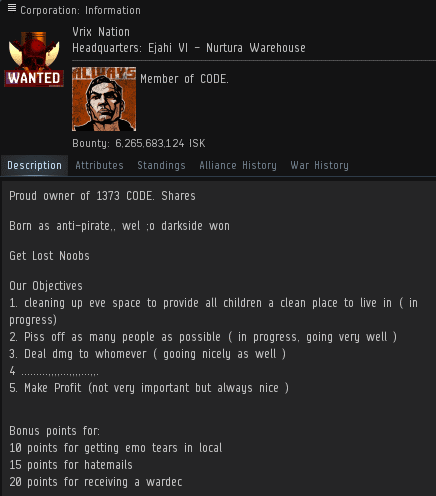 Vrix Nation is an elite PvP corporation that operates in highsec, where most EVE players live. With a 99.6% isk efficiency rate, Vrix Nation is the envy of PvP'ers everywhere. But it was the essential goodness and decency of its members, along with its commitment to excellence, that qualified the corp for admission to CODE. Vrix Nation kills Code violators of all kinds, but like other elite PvP groups, they have a specialty. Since there are no bubbles in highsec, pilots can generally escape with their pods by mashing the "warp" button. The destruction of so many bot-aspirant pods is further evidence--as if any were needed!--of Vrix Nation's elite PvP status. This is especially true since the New Order has succeeded in cutting shuttle autopiloting in highsec by 95%. Each Agent sends an informational EVEmail to gank recipients. This ensures that they know they weren't the victims of random violence; they earned their own destruction through their misconduct. The EVEmails also help recovering bot-aspirants learn how to avoid such disasters in the future. But in highsec, gratitude isn't always easy to come by. 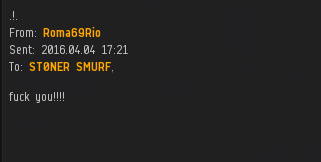 Vrix Nation's gankers, such as Agent ST0NER SMURF, kill AFK autopiloters all the time. How can you tell if someone's AFK autopiloting? Among the most common signs are post-gank lies and excuses. Some excuses are more convincing than others. erik destroyer has been playing EVE since 2008. He fancies himself an intimidating nullsec PvP'er who probably has powerful friends there. Sadly, after so many years in EVE, the only weapon in his arsenal is a poorly written EVEmail. Vrix Nation, like the rest of the corps in CODE., provides highsec with many essential services. Witness this satisfied customer, freed from the shackles of implants. Not everyone enjoys freedom, though. As the warriors of Vrix Nation travel across highsec, they enforce the Code. They're also busy searching for signs of intelligent life. Mostly they encounter angry carebears. But could a future Agent of the New Order be found among their targets? "Each Agent sends an informational EVEmail to gank recipients." No, they don't. Not always. Quite true. Sometimes, sheer pressure of work makes it all but impossible to attend to the admin in a timely manner. I certainly aim to deal thus with gank recipients, as a courtesy. Courtesy? I hear you say. Yes, courtesy. As our Saviour has often pointed out, the time for pre-gank warnings (and thus post-gank courtesies), is over. 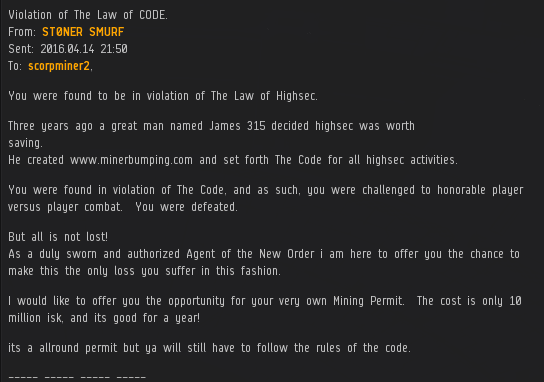 The Code and the New Order have been around since June 2012. If the carebears don't know why they've been ganked, then they damn well should. The illustrious voice of Sasha Nyemtsev (spelling?) speaks, and we listen with rapt attention! Zopiclone is hanging out with his grand kids these days. lol. This is funny because the real Zopiclone didn't write this. :) A story for the grandkids for sure! Another corp thatd non-stop winning!!! All code does is win!!!! "What you do unto the least of these, you do unto me." - Jesus. No weapon formed against you shall prosper, and every tongue which rises against you in judgment you shall condemn. This is the heritage of the servants of the New Order, and their righteousness is from me,” says James 315. But Where oh Where has Ming gone? Again, best ask your mother if she has the energy to talk. Go Ming, Go! This is something for the grandchildren! !